This week down Brit Grit Alley, I have a great guest column from Gareth Spark: 'An eccentric amateur teases out the murderer at some stately home. A whip-smart serial killer in a gloomy northern city taunts an alcoholic D.I., with an ex-wife and a taste for jazz. A gang of smart-mouth cockneys, clad in gold rings and inexplicable suits, battle themselves and one other across a brightly lit, lawless city. The holy trinity of British crime fiction; choose one, and continue. Only I've never been to a stately home, the Duchess doesn't have me round to tea that often; I never understood the 'genius serial killer and dipso-DI' dance either. Most serial killers are revealed in the end to be knuckle dragging Fred West-style illiterates, and I'm sure it's possible to be a British police detective without a quirky hobby and a taste for Glennfiddich, and the gangster as geezer? Let's just say the ones whose acquaintance I've been unfortunate enough to make in a turbulent life, were animal-cunning rather than smart, humourless and NEVER wore suits. Yet the fantasies persist, which is fine if that slightly 'off' reality, that writing about other writing, writing about TV shows, that post-modernist, self-referential foxtrot is what you're after; I've always wanted a way out of the ghetto. Enter Brit Grit. I like to think of Brit Grit as akin to Punk, something visceral, vivid and acid-sharp, kicking up from underground at the mainstream, those novels about High IQ murderers and boozy 'tecs and Marple-alikes lumbering like Woolly Mammoths, clogging up the scene. You have it in the brutal realism of writers such as Darren Sant, the Emile Zola of Rizzla papers and Kebab shops; the kinetic prose of Chris Leek, whose work crackles like a broken neon sign. It's in the cross-genre, heightened reality of Brit Grit Alley's maestro, Paul D. Brazill, whose nocturnal, existentialist tales flicker with the intensity of a dream half-remembered. It's over at Near to the Knuckle, at Thrills, Kills and Chaos and in the work of too many richly talented, neglected (natch) writers to mention. 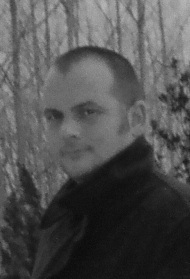 Bio: Gareth Spark writes dark fiction from and about the moors and rustbelts of the North East where grudges are savoured, shotguns are cheap and people get by in the economic meltdown any way they can. His work has appeared at Near 2 The Knuckle, Out Of The Gutter, Line Zero and Shotgun Honey.